Rosemary (Rosmarinus officinalis) has a bevy of beautiful benefits ranging from moisturizing your skin and supporting healthy collagen development to fighting off skin-damaging free radicals. Since ancient times, this aromatic herb has had a prominent role in religious rituals, culinary recipes and the natural medicine cabinet. Although its benefits vary depending on whether you’re ingesting this delicious herb or using it topically, rosemary is a great addition to your skincare routine. This fragrant evergreen herb is native to the warm, sunny Mediterranean region, although it can be grown practically anywhere as long you bring it indoors during cold winter months. Its green, needle-like foliage has a variety of uses in the kitchen and in natural medicine, which uses the fresh or dried herb to make teas, tinctures or capsules of the dried, powdered extract. Additionally, both the flowers and the leaves contain an essential oil -- rosemary oil boasts both topical uses and aromatherapeutic benefits. Whether you add it to your food, steep it as a tea or take it as a supplement, the antioxidants in rosemary help prevent skin damage and maximize skin tone by neutralizing free radicals. Free-radical damage compromises the support structure in your skin, leading to wrinkles, sagging and uneven skin tone. This flavorful herb is a good source of iron, calcium and vitamin B6, which supports healthy collagen levels. 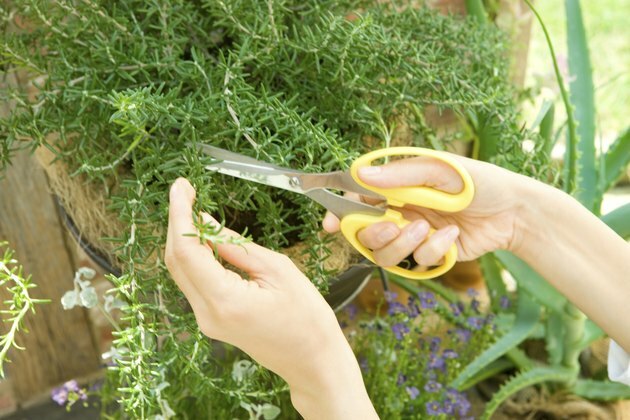 Rosemary is also a rich source of manganese, a mineral that helps minimize wrinkles and protects the skin from damage. Rosemary oil has properties to kill bacteria, fungi and viruses on the skin, which make it ideal for using on minor wounds and burns, or on problem skin that's affected by dermatitis, acne, eczema or psoriasis. The oil helps stimulate cell renewal, promoting healthy healing -- all while infusing the skin with moisture and improving skin circulation. In addition to being beneficial for skin, rosemary oil also helps improve scalp conditions such as dandruff, as it balances your skin and scalp's oil secretions. Like other essential oils, rosemary oil shouldn't be used on your skin without diluting it in a carrier oil. Unlike essential oils, which are extracted from the leaves, roots or bark of plants, carrier oils are derived from the nuts, seeds or kernels of a plant. Examples include coconut, avocado, evening primrose, olive, macadamia or rosehip-seed oil. Rosemary essential oil should never be taken internally. Likewise, if you are pregnant or nursing, or if you have high blood pressure or digestive disorders, you should check with your doctor before taking rosemary supplements. Additionally, rosemary can interact with certain medications, including blood thinners, diabetes medications and diuretics.